We find the whole problem: We find all the areas you didn’t realise were sore in the foot, lower and upper leg and even pelvis and spine that are contributing to the foot pain and resolve them. Effective treatment: We manually ‘work’, mobilise, massage and release these muscles, ligaments, joints and nerves removing inflammation, tethering and stiffness and regaining function. Orthotics: We address the common rearfoot and forefoot problems with orthotics if required. Prevent recurrence: We retrain balance/proprioception, which is imperative to preventing a recurrence of injury. Body alignment: Pelvis, hip and lower limb alignment is addressed in detail with weak muscles specifically trained and all affected muscles and nerves are balanced and stretched. Rehabilitation items: such as Kinesio and sports tape techniques specifically to support the foot are used; also braces, stretch bands, rollers or bolsters may be implemented. Braces and stretch bands are used for allow optimal recovery. In the case of fractured toes or metatarsals in the foot we stock air cast boots which we can fit for you. See Rehab items page. Footwear: Options and goals for footwear and activity modification are discussed with you. Dee Why Physiotherapists are experienced in diagnosing and resolving foot pain effectively, treating the presenting issue and all the underlying causes or predisposing factors. Manual therapy and hands-on treatment is imperative and involves the entire foot and lower leg as there is invariably significant involvement in both areas. Specific personalised stretches and exercises are then introduced and biomechanical issues resolved. Supportive elements are always required in the treatment of foot pain ranging from taping, to bracing, orthotics and in the most extreme injuries an air cast boot which we keep in stock. Molded Orthotics – Only $75 plus consultation fee. At Dee Why Physiotherapy we have excellent outcomes with our orthotics and our patients love them. All our orthotics are heat molded and are personalised to your foot and lower limb alignment. We choose to use the “TalarMade” heat molded orthotics, which achieve the perfect balance of comfort and control achieving excellent outcomes consistently for our patients for many years. The orthotics have consistently achieve excellent outcomes in our practice for many year in the treatment of sports injuries, back pain, hip and knee pain, lower leg syndromes such as “shin splints”, tendonitis of Tibialis Posterior, Peronei and Achilles tendonitis. For a fraction of the price of most Podiatrists orthotics ($500+) we achieve an excellent result for our patients who do not wish to make the financial commitment of other types of custom orthotics at that time. We usually choose the highest density orthotics in this range to achieve maximum control whilst maintaining excellent comfort. In some circumstances we opt to choose this ranges softer orthotic which still offers our patients the stability required and giving them the comfort needed for more sensitive, painful foot conditions. 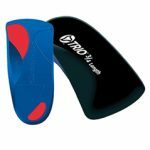 We can often then progress to the higher stability orthotic once the problem is resolved with physiotherapy and the use of the softer orthotic.